We are a whirlpool and hot tub repair business that services all makes and models. Our service area extends to 100 miles from our home base in Waunakee, WI but some diagnosis can be made over the phone (608-712-7728). We also supply chemicals, hot tub accessories and a wide inventory of parts. 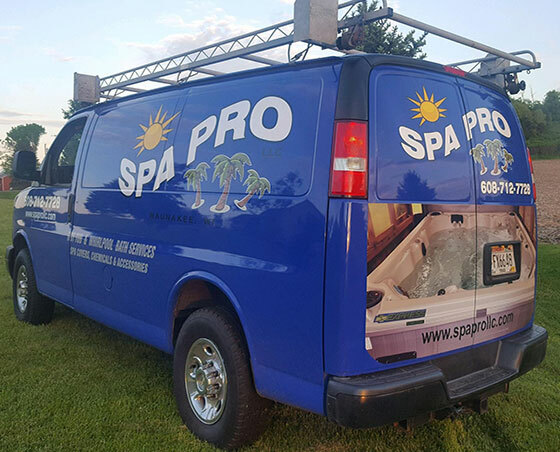 We've been repairing whirlpools and hot tubs for over 12 years (20+ years of general experience) and have many dozens of happy clients! Prompt, professional and ready-to-serve. Schedule an appointment and we'll be there for you! With our vast expertise, we can service almost anything. We also provide chemicals and accessories! I just wanted to send a note to say thanks for your visits and sound advice. We have had our spa for 13 years but never really had anyone we trusted before who we could call or have visit and charge us reasonable prices for service/advice. It is sincerely appreciated! Thanks so much for coming out on the same day I called you! You’ve managed to keep our hot tub alive over the last eight years! I just wanted to THANK YOU for the excellent job you did repairing out hot tub. It works ten times quieter and seems to be more efficient. I appreciate you driving the distance twice to make it happen. Thanks again! Thank you very much on winterizing my hot tub on such short notice and out in the cold! We have over 20 years of sales experience! We've made over 5000 service calls! Count on us to diagnose any system issue you may have! We can order and replace just about any part you may need!